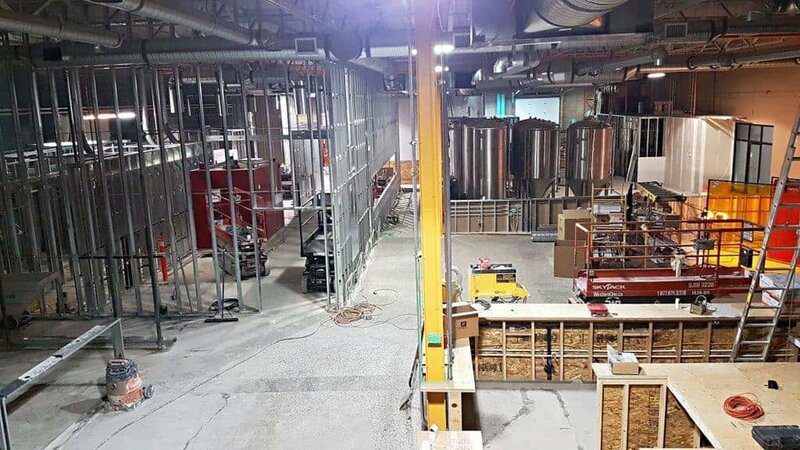 Opened in June 2018, Prairie Dog Brewing has quickly become a beer & BBQ mecca here in Calgary. Known for delicious craft beer, Prairie Dog is also home to Clifford, the biggest BBQ pit of its kind in Canada! We sat down with Founders Gerad Coles and Tyler Potter to learn how they transitioned from the world of home brewing into opening a brewery, the next major trends in Albert's craft beer industry, and the not-so-glamorous truth about opening a brewpub. Home brewers, listen-up! Gerad, do you remember the first ever beer you shared with your dad? Gerad: I didn’t like beer until I was into my 30’s, so I missed out on the dad/son bonding experiences around beer, unfortunately. No worries. We're thankful your tastes changed because you guys make some fantastic beer! How about your daughter? What will you share as her first beer? Gerad: Probably a simple summery ale like a wheat beer that we could share after a hike or hard day of yard work. Something refreshing that isn’t too intense and could give her a bad first experience, like Show Pony from Last Best. Agreed, Show Pony is a great intro to craft beer. Jumping back a few years, before deciding to open the brewery, what line of work were you guys in and what made you both switch careers? Gerad: I designed and supported the technical infrastructure for websites with a lot of user traffic and media content, as well as managing analytics and monitoring platforms. I got out of that because I felt like my career was always focused on building or supporting ephemeral products/systems that nobody outside of my coworkers could understand, whereas beer is something for the everyman; also this allowed me to build a business that contributes much more directly to the local community and economy than an online one does. Very interesting! Tyler, how about you? Tyler: Like Gerad, I was living in California, working in tech and always looking for a way to share my work with friends and family but was met with a lot of glossy eyes. I got into home brewing and unsurprisingly, it was easy to share the beer I made. Surely every home brewer has stood in his/her garage with the boil going and thought to themselves about how cool it would be to start a brewery. When my wife and I decided that we’d had enough of California and wanted to move back to Canada, the perfect storm of circumstances came together to support a business venture with friends and family. That's pretty impressive, you guys were able to leave your old careers behind and jump into the craft beer business. Good on you for taking a leap and following your dreams. Gerad: We picked Prairie Dog out of hundreds of names that we brainstormed, because it best reflected who we are and how we want our brand to be viewed - humble, communal, fun, and the basis for a local ecosystem. The history of the Prairie Dog also closely parallels that of craft beer; chased to the brink of extinction by our forefathers and found in hindsight to be a critical part of the prairie ecosystem, now returning. We love the analogy! Tyler, what's your take? Tyler: I like to talk about how interconnected Prairie Dog towns are, with tunnels connecting burrows and the community working together to avoid predators and prosper. Our goal has always been to be a part of the community and an active player in the Alberta Economy. We are intricately connected to the agricultural industry (Alberta grows some of the best barley in the world), and to the people we support through direct employment, or via any of the dozens of local vendors and services we employ. Especially in a world dominated by large corporations, it's great to see such an increasing trend towards supporting our local businesses and farmers. Speaking of trends, in your opinion, what’s the next big trend in Calgary's craft beer scene? Are there any particular beer styles you feel we are currently lacking here in Calgary & Alberta? Gerad: I believe that diversification is going to be the major trend to come as our market becomes more crowded. Instead of every new brewery creating a wide array of styles to try to make everyone happy, many will begin to focus on doing one thing really well, such as barrel aged sours and traditional lambic-style beer, session beer, lagers, etc. In Denver, for example, there is a brewery devoted to making only Red beers (like Irish Red, Red IPA, etc), and there are two heavy-metal themed breweries. Open-fermented and barrel-fermented sours are lacking in Alberta and still have a long way to go to achieve the complexity and refinement found in mature markets, so there will likely be a large amount of growth there. Also, like us, many breweries will start to look at offering food as a way to compliment their beer offerings and increase traffic to their tap rooms. We 100% agree, niche is the new big, and trying to appeal to everyone gets you lost among the herd. Tyler, what's your opinion on this? Tyler: The Alberta craft beer scene is still very young, especially when compared to that of BC, or states such as California, Colorado, and the like. We can look to these other markets to see what trends may pass through Alberta, but I think that beers incorporating more fruit, spices, and vegetables (like the ginger in our ginger lime Gose) are going to really start to take off. In this young market, the breweries make beer for the beer drinker. Once the scene becomes well established, breweries can take more risks and make beer with more and more different and funky flavours. A big hit for us at Beerfest was our Cinco De Mayo, a “Taco in a Glass”. Prairie Dog Ginger Lime Gose – SO GOOD! We had our first taste of your Ginger Lime Gose a few weeks ago and it was incredible! Such a refreshing, easy-drinking summer beer. On the topic of firsts, if someone were to visit Calgary for their first time, has never tried a craft beer, and you know they will always remember the very first craft beer they ever tasted, what would you serve them first? Gerad: I’d first ask them what other beverages they really like to drink -- red wine or white, coffee or tea, cider, etc, and try to find a beer in our offering that has similar flavour and aroma notes. For example, people who really like black coffee may like a dry, roasty stout, whereas people who put sugar and/or milk in their coffee may like a milk stout, chocolate porter or a brown ale. People who drink dry sparkling wines and ciders may prefer the acidic bite of a sour beer, or the oaky quality of barrel aged beers. If I had nothing to go on at all, I’d serve them our hopped wheat because it was designed to be easy to drink but full flavoured, and the citrus quality combined with the bready finish makes the beer refreshing and easy on the palate. Very interesting! Tyler, what's your strategy? Tyler: I’d probably ask them about what they like to drink, like Gerad, but I’d lean towards offering them a glass of our Dessert Stout if I could sell them on it. It’s my very recipe that we brew, so I’m biased towards it - Gerad has the best approach here for sure. Dessert Stout, sounds pretty tasty! We haven't yet tried that one. How about you guys, do you remember having your first ever craft beer? Was it simply experimental or did someone introduce you to it? Gerad: I honestly don’t remember my first craft beer because at that time I just wasn’t into it and it wasn’t very memorable. However, the first time I had a craft beer that really blew me away was our cousin Michael’s home-brew IPA (Michael has since gone on to found Three Ranges Brewing in Valemount, BC). Before that time, I’d never had a hoppy beer, and the freshness of the beer and citrusy/piney aromatics combined with an assertive bitterness just really surprised me and excited my palate, and ultimately that beer, combined with Pliny the Elder from Russian River Brewing are what inspired me to take up home-brewing. Very cool! We'll keep our eyes peeled for anything from Three Ranges Brewing. Gerad: Zero Issue’s Nemesis is one of my favourite beers. Though it comes in at over 70 IBU, the beer has lots of body and a water profile which makes it so easy to drink, combined with an incredible orange/grapefruit juice character that's both refreshing and makes you beg for another sip. My second choice would probably be the All Nighter Vanilla Cappuccino Porter from Cold Garden. I’m a huge fan of coffee beers and sugar in my coffee, so this one just does it for me. Third choice would be Show Pony from Last Best. Though I rave about so many of Last Best’s beers, Show Pony is so easy to drink and soft on the palate with a delicate citrus. It's nice to take a break from all the big IPAs, stouts, sours etc. with a beer like Show Pony. We haven't yet tried the Cold Garden Porter, but 100% agree with you on the Nemesis and Show Pony. Tyler, what are your top 3? Tyler: The All Nighter from Cold Garden, Une Vieille Maîtresse from Dandy and Big Rock’s Trad'. They’re each quite different and it depends on where I am and the mood I’m in. The All Nighter goes down so smooth, and when Cold Garden has some left, I drink nothing but The Velveteen (which is their nitro version of the All Nighter). The Grisette (Vieille Maitresse), is a simple, but interesting sour that comes with a lot of history behind the style. Finally, Trad' is a testament to the breweries that have come before us and helped to pave the way for all us little guys. It’s on tap at most of the bars in town, and even in those that typically carry only the big guys, you can always find Trad'. So many of us started our craft beer journey with Trad', it's a true classic for sure! As for Prairie Dog, is there anything special or unique you’d like people to know about your beers? For example, is there something uncommon you’re doing, or a local ingredient you’re using which no one else is? Gerad: Not especially. We focus on using as much local or Canadian ingredients as possible. One thing we do a little differently than most is inoculating our kettle sours with the microfauna already present on pilsner malt, rather than using a probiotic pill or yogurt, which I believe gives the beer slightly more complexity. That's great to hear! Supporting local ingredients is more important than ever right now. Tyler, how about you? Tyler: One thing we’re doing here that no one else can do is use freshly smoked malt in our beers. We made our Oatmeal Stout and Smoke on The Lauter (collab with Last Best) using flaked oats smoked in Clifford, the Big Red BBQ. Clifford, the Big Red BBQ! What’s one surprising hurdle you overcame of which most visitors don’t realize when they walk through your door? Gerad: I'm surprised by how many ways governments get their hands in our pockets and interfere with our business model, either because they don’t understand the fundamentals of brewing and selling craft beer or because they know that they can squeeze us like a wet rag without any powerful lobby representing the craft beer industry. Oh yes, it's a constant struggle given the ever-changing laws around the industry. I'm sure you guys have had many sleepless nights. On that note, if you could give one piece of advice for anyone aspiring to open their own brewery, what would it be? 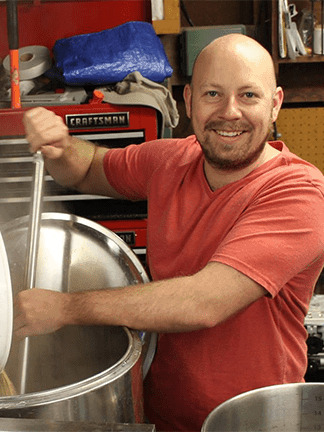 Gerad: If you want to start a brewery solely because you love brewing beer and sharing it with people, then this is not the business for you, stick to home brewing. Operating a brewery is an exercise in extreme patience where you can almost never find time to enjoy the fruits of your labour, and where you often wake up to find more bad news as governments conspire to make it harder for your small business to operate, and to eventually pass your business on to your children or employees. It's a labour of love, not for the faint of heart and not for those who expect a work/life balance of any kind. This is a great reality check for the legions of home brewers who aspire to open their own shop one day. Tyler, what are your thoughts? Tyler: Know what you’re getting into. There is an awful lot of hard work, lost sleep, sacrificed relationships, moments of deep introspection, and questioning of everything. Talk to the owner of a local brewery. More than once! Keep going back and work through all their positive stories (those are the ones they tell first), until you learn that the owner has remortgaged their house and are covering payroll on their credit card. Better yet, go talk to Andrew at Annex Ale Project. He’ll tell you straight from day one! That being said, we’re always happy to grow our industry and community, so join us, if you dare. The Prairie Dog crew enjoying some cold brews! This is some excellent insight guys, thanks for sharing to cold hard truth which most people don't realize. Gerad: I have to say Russian River in Sonoma, California, because it is a beer mecca. People travel from all over the world to drink their beer. They have flight paddles with 20 of their beers, many of which are barrel aged Sonambic – a term coined for their Sonoma Lambic wild/sour barrel-aged beer. People line up around the block to get in and have their beer. The atmosphere is just abuzz with people talking beer, wearing beer shirts and hats from everywhere, and the food is just delicious. Russian River is what first inspired us to build a brewpub. Sounds amazing! We've added it to our travel list. Tyler, what was your most memorable brewery experience? Tyler: For me, it would probably be Brutopia on Montreal’s Crescent St. I lived in Montreal for a couple of years in my early 20's and that’s where I discovered a world of beer I’d been missing out on. Brutopia had a great vibe, always fresh beer and was a great place to go with friends. Brutopia is now on the list as well, thanks for the heads up! Gerad: I would have to go with Velvet Merlin from Firestone Walker. A delicious mid-strength oatmeal stout which finishes dry and feels just as refreshing to my palate as a pilsner or wheat beer. Tyler: I’d drink Prairie Dog beer because I make it. We can't argue with that! You guys make some delicious beer and we're incredibly excited to watch Prairie Dog grow over the coming years. Thanks again for your time guys, we've certainly acquired a new-found respect for the work you do and the sacrifices you make. It's been a pleasure catching up! Keep up the great work and chat soon!! What's the most memorable brewery you've ever visited (Calgary or anywhere else)?